Achieving climate smart agriculture depends on understanding the links between farming and livelihood practices, other possible adaptation options, and the effects on farm performance, which is conceptualised by farmers as wider than yields. Reliable indicators of farm performance are needed in order to model these links, and to therefore be able to design interventions which meet the differing needs of specific user groups. However, the lack of standardization of performance indicators has led to a wide array of tools and ad-hoc indicators which limit our ability to compare across studies and to draw general conclusions on relationships and trade-offs whereby performance indicators are shaped by farm management and the wider social-environmental context. RHoMIS is a household survey tool designed to rapidly characterise a series of standardised indicators across the spectrum of agricultural production and market integration, nutrition, food security, poverty and GHG emissions. The survey tool takes 40–60 min to administer per household using a digital implementation platform. This is linked to a set of automated analysis procedures that enable immediate cross-site bench-marking and intra-site characterisation. We trialled the survey in two contrasting agro-ecosystems, in Lushoto district of Tanzania (n = 150) and in the Trifinio border region of Guatemala, El Salvador and Honduras (n = 285). The tool rapidly characterised variability between farming systems at landscape scales in both locations identifying key differences across the population of farm households that would be critical for targeting CSA interventions. Our results suggest that at both sites the climate smartness of different farm strategies is clearly determined by an interaction between the characteristics of the farm household and the farm strategy. In general strategies that enabled production intensification contributed more towards the goals of climate smart agriculture on smaller farms, whereas increased market orientation was more successful on larger farms. On small farms off-farm income needs to be in place before interventions can be promoted successfully, whereas on the larger farms a choice is made between investing labour in off-farm incomes, or investing that labour into the farm, resulting in a negative association between off-farm labour and intensification, market orientation and crop diversity on the larger farms, which is in complete opposition to the associations found for the smaller farms. The balance of indicators selected gave an adequate snap shot picture of the two sites, and allowed us to appraise the ‘CSA-ness’ of different existing farm strategies, within the context of other major development objectives. Hammond, J., Fraval, S., Etten, J. van, Suchini, J.G., Mercado, L., Pagella, T., Frelat, R., Lannerstad, M., Douxchamps, S., Teufel, N., Valbuena, D. and Wijk, M.T. van. 2017. The Rural Household Multi-Indicator Survey (RHoMIS) for rapid characterisation of households to inform climate smart agriculture interventions: Description and applications in East Africa and Central America. 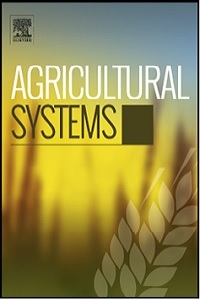 Agricultural Systems 151:225–233.